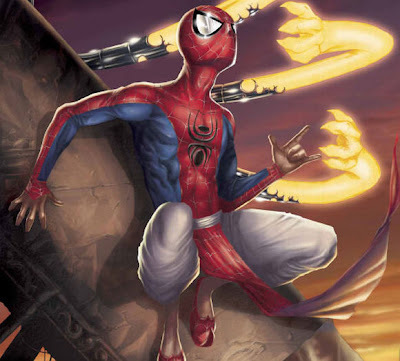 Spider-Man: Never Mind Miles Morales, What About Pavitr Prabhakar? Looks like the decision of giving Spider-Man a massive makeover (replacing the white science geek, Peter Parker, with a half black half Latino teen, Miles Morales) has provoked some quite uncool reactions among readers of some of the newspapers where the change was announced... Even so, from what I understand (feel free to correct me if I'm wrong) , the change only affects the Ultimate Marvel Universe's Spidey. The news was initially released on USA Today, and if you made the mistake of venturing into the Comments section (which, shame on you to begin with) you may have seen some particularly disgusting reactions to the news. Honestly, I don’t see what the big deal is. After the events of Death of Spider-Man, we knew that a new character was going to be taking over, so that’s not really a surprise. The only thing to be “shocked” about is the character’s ethnicity, and what difference does that really make? The story was always going to be about a new character trying to live up to the model of heroism that was established by Peter Parker. It doesn’t matter what the background of the character is, that’s all just set dressing. What’s important is how the writer will tell that story. "It feels like if you're white, heterosexual, single, able-bodied, law-abiding, English and live in England you have no rights at all." All those very BNP and EDL (and their equivalent in the US) inspired comments are nothing new, though... I remember too well the very similar ones made when 'Spiderman: India' was announced. Sadly, some people haven't learned much since 2004. We should all know by now that, when it comes to superheroes, nothing is written (or drawn) in stone anymore... and many have already gone through changes. In Ultimate Spider-Man, Peter is a high-school student who is bitten by a spider during a school field trip—but instead of a radioactive spider (which reflected the Atomic Age in which Spider-Man's origin was written), it is a lab subject that has been genetically modified by Osborn Industries. This idea of using genetic engineering instead of radioactivity was used for the Spider-Man film. The themes, characterization, and setting are updated to reflect modern life. It is set in the Ultimate Marvel universe. 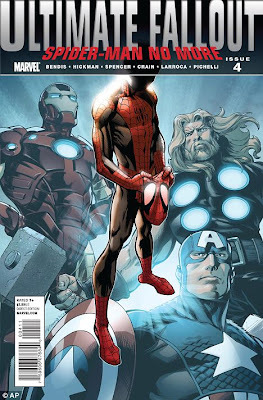 In the on-going series Ultimate Comics: Avengers, a second Spider-Man was shown to be one of its members, and is simply referred to as the Spider. The Spider is sarcastically referred to by Gregory Stark as a clone of Spider-Man and Charles Xavier "back from the future with a warning for humanity". He subsequently calls Black Widow "stupid" for believing him. After Peter Parker's death in Ultimate Comics Spider-Man #160 a new character by the name of Miles Morales takes up the mantle of Spider-Man. He is half-black, half-Hispanic and has the powers of Spider-Man plus some new ones. 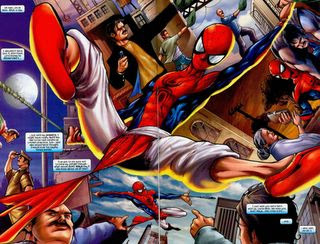 An alternative version of Peter Parker also exists in the MC2 universe, appearing as a supporting character in Spider-Girl. In the "House of M", a Marvel crossover, the Scarlet Witch alters reality to make mutants the ruling class over humans. This world is ruled by mutants and their leader, Magneto. In the mini-series Spider-Man: House of M, Peter Parker is believed to be a mutant, and Spider-Man's identity is widely known. He is rich, famous and married to Gwen Stacy, and they have a young son named Ritchie. Aunt May and Uncle Ben are alive and in good health, and J. Jonah Jameson is Peter's often-abused publicist. Unfortunately, his life unravels when Jameson reveals to the world that Spider-Man is not a born mutant..
Mary Jane Watson, a.k.a. Spider-Woman, is part of a resistance against the techno-organic virus and heroes infected with it, including that world's Spider-Man. Mary Jane is also portrayed as a lesbian in issue #34. A version of Spider-Man 2099 joins the Exiles when his identity is made public. 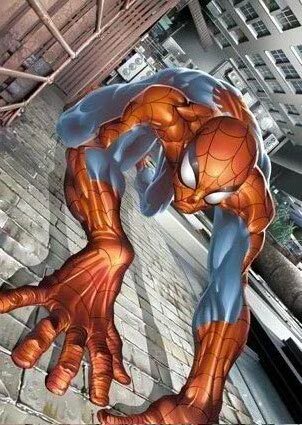 Morph fought a Demon Spider-Man on an alternate world. Later, the Demon Spider-Man was viewed briefly by Mojo and Major Domo as it attacked a young couple in a parking complex, but Spider-Man killed himself. In New Exiles #9-10 there is a world where Peter Parker is part of a mutant super hero team, Force-X, led by Emma Frost. His codename is "Spider". His outfit is the standard Force-X uniform and he wears goggles instead of a mask. Also, his webbing is organic. And, that's only a few mentioned alternative versions here... there are plenty more (with more info and details) where they come from. In 2004, the Gotham Entertainment Group (Indian publishing licensee for Marvel Comics) announced the launch of a Spiderman more relevant to their readers in India. Sharad Devarajan, Gotham's chief executive officer. The series was created by Sharad Devarajan, Suresh Seetharaman, and Jeevan J. Kang with Marvel Comics. It ran for four issues, which were later also published in the United States in 2005. The only difference was in the fact that the Indian version wore a dhoti (Indian wrap-around worn by men) and jooti (traditional shoes). The first of the usual classic Spiderman's villains to get the same treatment as our web-swinging hero was The Green Goblin... He was now Rakshasa, a demon from the Hindu mythology. The Rakshasas are said to have magical and shape shifting abilities and are described as green, yellow, or blue. On a more trivia-like connotation, a Rakshasa has previously appeared in an episode of the 1970s TV series 'The Night Stalker'... In that particular episode, the investigative reporter Carl Kolchak tracked the demon down and eventually killed it. Pavitr Prabhakar, a poor Indian boy from a poverty-ridden village, moves to Mumbai with his Aunt Maya and Uncle Bhim to study after getting half a scholarship. His parents died some years ago. Other students at his new school tease him and beat him for his studious nature and simple background. He knows his uncle Bhim is struggling to support him and his aunt Maya, and pay his school fees. Only Meera, a popular girl from his school, befriends him. Meanwhile, Nalin Oberoi, a local crime lord, uses an amulet to perform an ancient ritual, where he gets possessed by a demon committed to opening a gate for other demons to get back to Earth. Was 'Spider-Man: India' A Success Or Not? But, it sure also brought some rather interesting discussions regarding the agenda/mission behind it. "At first, the suggestion that Pavitr has a destiny that he must fulfill may strike some readers as un-American. In the land of opportunity, we reject out of hand the notion that individuals must resign themselves to their fate. Instead, we believe that there are no limits to what can be achieved by a combination of hard work and ingenuity. Yet is the concept of destiny really so foreign? Was it not under the banner of Manifest Destiny that the young United States claimed for itself the Great Plains and the northern reaches of Mexico? Was it not Ronald Reagan who constantly reminded the citizens of the United States that they had a “rendezvous with destiny”? To what else did George W. Bush refer to in his second inaugural address when he stated that “History has an ebb and flow of justice, but history also has a visible direction, set by liberty and the author of liberty”? The most important difference Spider-fans will notice between the Indian and American notions of destiny is the Indian belief that tyranny and evil are primal forces no less powerful than freedom and good. Yet there is also a considerable measure of doubt embedded in the American vision of progress. 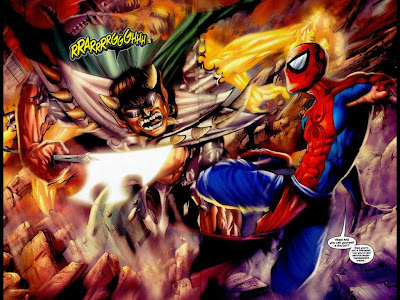 Although one scientific accident gave Spider-Man his powers, other scientific accidents were responsible for the creation of his arch-nemeses, Dr. Octopus and the Green Goblin. In the final analysis, that which makes Pavitr Prabhakar authentically Indian does not make him in any way un-American. Today the Republic of India is the most populous democracy on the face of the Earth. Someday, it may rival the United States in terms of wealth and power. Conventional thinking suggests that the emergence of a second superpower would threaten the security of the United States of America. 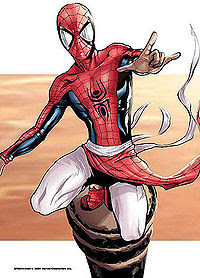 Yet if India’s first superhero recognizes that with great power there also comes great responsibility, perhaps we should look forward to the emergence of an Indian superpower..."
Now, that makes a change from the boring and tiring (as well as so predictable) whining we get from the pathetic "Keep Spidey White!" Brigade, doesn't it? In the words of Mr. Stan Lee himself: Nuff said! 16 Best(?) 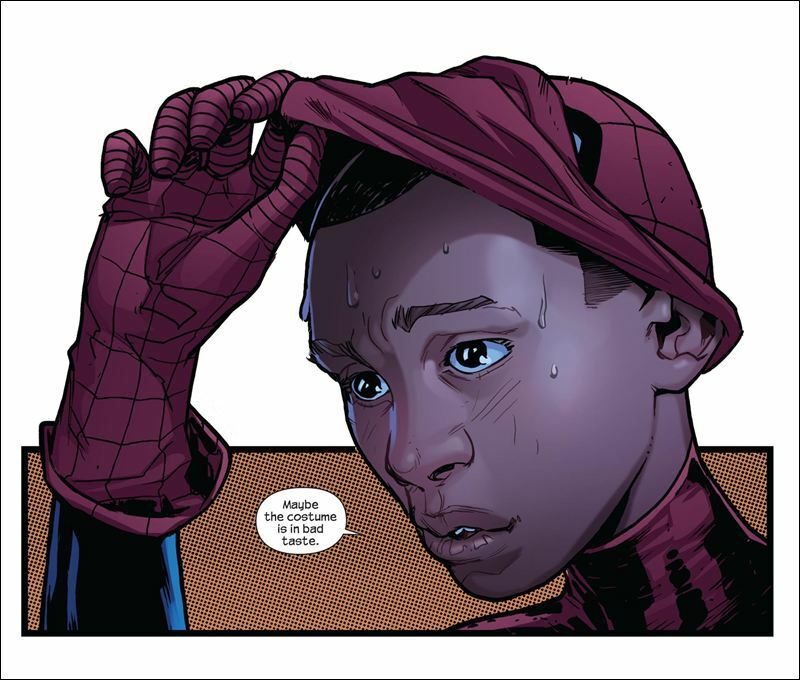 Racist Facebook Comments About "Black Spiderman"
Where is SUPERIOR SPIDER-MAN Headed?